How to adapt to new situations, play different roles without pretending to be someone you are not. 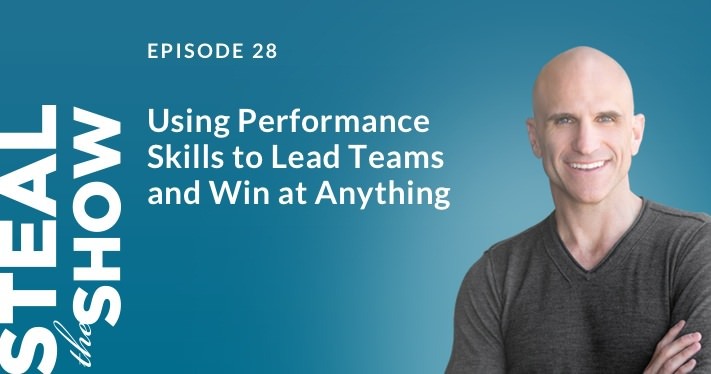 Use this little known technique to lead teams and win at anything. From supporting roles to leadings roles, how to adapt and win. 00:00 Welcome to Steal The Show with Michael Port. I am Michael, and you are gonna learn how to steal the show. 00:10 Use this little-known technique for leading teams and winning at anything, the same one that helped the US hockey team overcome tremendous odds and beat the Russians in the 1980 Winter Olympics. 00:23 Ever been in a situation where you felt a little bit uncomfortable, like you didn’t fit in, you just didn’t feel like you were playing the right role for the the situation and you didn’t know what to do? That happens, it happens to a lot of us, but what I wanna help you do is play the right role in every situation, so you become more confident because you have a plan and the right roles for optimizing any performance, and when I say performance, that could mean giving a speech, in a job interview, on a first date, spending time with your mother-in-law. You’ll become more adept as a communicator as you learn new insights to draw on, and I think you learn more about yourself and your capacity to inspire and motivate. 01:08 Simona Panova, author of “Nightmarish Sacrifice”, said, “I am always in a role, lovely for you, for them, even for myself. Yeah, even when I’m alone, I am still in a role, and I, myself, am the most exacting audience I ever had.” Many of the world’s greatest leaders, along with effective people from all walks of life, they know how to play different roles, yet still authentic roles, that help them fit in with may diverse groups of people and scenarios of all kinds. So whether you’re preparing for a presentation, being promoted, being reassigned to a new position, discovering how to play different roles, and adopt new styles of behaviour powers up your creativity and confidence. So this episode will help you develop new skills to present, to pitch, to perform, and sometimes we think that someone who plays different roles is a shape-shifter, is a manipulator, is someone that can’t be trusted, but I’m not talking about that. I’m talking about building on who you are, what you stand for and what you already do, and doing it for a purpose. Because when you’re playing the right role, you are persuasive in those roles because you are authentic to you. You’re amplifying the most positive, the most powerful, the most compelling parts of you personality, and it’s really quite fun. 02:48 I know this may seem contradictory, but if you stay rigidly fixed on what you see as you true self, you might not realize that you can adopt different styles of behaviour and still be authentic. I’ve spoken for so many years on this particular concept, this idea of adopting your style of behaviour in all aspects of life. This is one of the things that I learned to do as an actor, and it can be applied as a model to real-life, but without ever pretending to be something that you are not, but if you stay rigidly fixed on what you see as your true self, as I said, you might not realize that you have the potential to play lots of different roles in lots of different situations. 03:38 I read an article in January of 2015, in the Harvard Business Review, by Herminia Ibarra, and it’s really interesting, because she presented this concept in relation to leadership, and I was thrilled that she did. She said, and I’ve got this here, she said, “As we strive to improve our game, a clear and firm sense of self is a compass that helps us navigate choices and progress toward our goals, but when we’re looking to change our game, a too rigid self-concept becomes an anchor that keeps us from sailing forth.” Now you may think I like that quote because there’s a reference to boating, but no. I’m a big boater if I hadn’t… I say that every five minutes, so if you’ve listened to anything I’ve ever done you probably know, that’s why I apologize, in advance and afterwards, for the fact. But no that’s not why I love it, I love it because it demonstrates that people who are able to adopt different styles of behaviour to suit the dynamics of a given situation are comfortable adjusting their style to different situations without feeling fake, or pretending to be something that they’re not. 05:02 So, when you’re attempting to wow an audience or to close a deal or to pitch an idea, you win when you present the best parts of yourself, but not every part of yourself. You succeed when you amplify the parts of your personality that match the needs of the moment, and you set aside, but do not hide, the parts of yourself that don’t. But people who are fixated on one value system, one way of being, they tend to express what they think and feel even when it runs counter to situational demands, and doing so is not always necessary. I’m not suggesting that you put your values under the table or kick them under the rug, not at all, but expressing yourself in a situation where you don’t need to express yourself, if it runs counter to situational demands, might be a demonstration of rigidity, the need to be right, the inability to improvise as needed, or it might even demonstrate an intolerance of other perspectives or style of behavior, and as a result, the folks, the people who feel compelled to express what they think or what they feel when it’s not appropriate for the given circumstance, they often have trouble performing the role required in new situations such as moving from, say middle management into a leadership position, or from employee to entrepreneur, from associate to partner; heck, even from married to single or single to married. 06:41 So I know it’s a little bit confounding, but if you’re willing to entertain the idea that you can authentically play different roles and adopt different styles of behavior so that you can glide from one scenario to another and one group of people to another, you may have access to opportunities that previously weren’t available to you because successful and effective people will often play different roles to suit the situation. They’re willing to experiment with playing different roles, until they become comfortable with the new behaviors or attitudes required to play their new parts, and eventually, each role fits them authentically and brings out their strengths. For example, Tim Cook, the CEO of Apple. So he already mastered a number of different roles as Steve Jobs, chief operating officer, and he coached divisions and he led teams all over the world, and he cultivated and educated major retail customers, and he interacted and communicated with Jobs himself, which I heard it wasn’t always the easiest thing in the world. But when Cook became CEO of Apple, he had to learn to play new roles, particularly that of being the company’s public spokesman and leader of its brand, that was new. So Cook now introduces Apple products in closely scrutinized presentations, and he meets certainly with the most influential business and financial media, which was a newer role, and those were roles that Steve Jobs once played. 08:06 But on October 30th, in 2014, Cook did a brilliant take on a new role, a gesture that resonated all over the world, for many people. In an article published in Bloomberg, I think it was Businessweek, ‘Tim Cook Speaks Up’, was the title of the article. And he said something that was quite rare for a CEO. He auditioned, really, for a new role, and he performed it quite brilliantly. He announced he was gay, and he said it was… And I’ve got it here, hold on. Yeah, “One of the greatest gifts God gave me”. Now, he wrote that he didn’t hide his orientation. Most people at Apple knew and treated it as a mundane matter. He acknowledged that because so much of his life at Apple kept him in the spotlight, it was important to him to preserve a private sphere of his life. But he found a role that was calling to him, that of, I guess what I’d call, a socially responsible citizen. He saw that the prominence of his position, particularly as a white male CEO in a global technology brand, it offered him the opportunity to provide an example that could inspire and comfort, and perhaps even protect others. 09:26 So he didn’t do this for the stock price or to get an edge on his competitors, he used the article to articulate and assume a role that others hadn’t expected he’d play. I see it like this: I think Cook wrote the lines for his true character to play in this new role, because this is what he said, he said, “I don’t consider myself an activist, but I realize how much I’ve benefited from the sacrifice of others. So if hearing that the CEO of Apple is gay can help someone struggling to come to terms with who he or she is, or bring comfort to anyone who feels alone, or inspire people to insist on their equality, then it’s worth the trade-off with my own privacy.” So, I’ve got no doubt that a career that consisted of playing many different roles, it helped him prepare for that moment, but I’m sure it still requires some rehearsal, some planning, some preparation. He even acknowledged how he plays different roles. There’s another quote. He said, “I’m an engineer, an uncle, a nature lover, a fitness nut, a son of the south, a sports fanatic, and many other things.” That’s pretty cool. It’s such a perfect example of what I’m sharing with you. 10:42 Here’s a different kind of example: So a lot of coaches do this, from Herb Brooks to Phil Jackson. They get inside their players heads and they motivate them to perform. And Phil Jackson, he plays the Zen master, to near perfection; he talks to the media, he writes books, and sprinkles into talks with his players and coaches his understanding of Eastern philosophy and psychology, and how it applies to winning at the mental game. 11:08 Now, here’s a little known secret about leading teams and winning at anything, and it is the thing that helped the 1980 US men’s hockey team beat the Russians in the Olympics. Now, this was a feat of really quite shocking proportion. This was not expected. If you don’t know the story, go watch the movie ‘Miracle’, it’s just absolutely inspiring. I’ve watched it… I’ve seen it 10 times and I love those kind of sports movies. But what you may not know, is that the US team’s coach, Herb Brooks, he consciously developed a role as part of his strategy to compete. Now as a coach at the University of Minnesota, his coaching persona was a nice guy, supported his players, but in coaching the US Olympic team, he played an entirely different role. So, knowing that the players he selected, they came from different college programs and they’ve been rivals on the ice, fought with each other all the time, so he needed to break them down before bringing them together. So he accomplished this by becoming a demanding drill sergeant of a coach who pushed the players through all-night skating drills. And he effectively brought them together by making them hate him, and his harsh style, I think more than they hated each other, so by the time they reached the Olympics, these players had bonded over their experience and they felt unified as a team. 12:48 So he took a big risk in playing that role but it paid off. He was not their friend, he was a coach who played a role, and the role brought the team together, and they won. So, I’m sure you can think of many other examples from the leaders that you’ve admired who’d played different roles, and as I mentioned earlier, there are benefits. Just remember, you become more confident when you play the right role in every situation because you plan on it. You become a better communicator, you don’t always go “bup-bup-bup,” like I just did, but you will become a better communicator, as you learn how to play different roles, the right role in every situation, and of course you learn more about yourself, and your capacity to inspire and to motivate. So this is a behavior, this is a tool that you use from time to time, with some effectiveness, I’m sure, whether you realize it or not. The question is, do you wanna grow and gain the value from employing this approach intentionally? I hope so, because when you start identifying roles you’d like to play and you open up to new styles of behavior, you move from supporting roles into leading roles. 14:02 So I think it’s time that you got a copy of ‘Steal the Show’ if you haven’t yet. So go to stealtheshow.com and pick up a copy. When you do, I’ve got lots of bonuses to give you, free giveaway, things to incentivize you to buy the book; things like, free templates for content creation and storytelling, free videos, even free videos on the business of speaking if that’s something you’re interested in, and events around the country, buy a couple books, get a ticket for the event. So that is really cool, and I’d like you to go there, to stealtheshow.com. And get a book, read it, and if you like my voice, then pick up the audio book, you’ll like that as well. 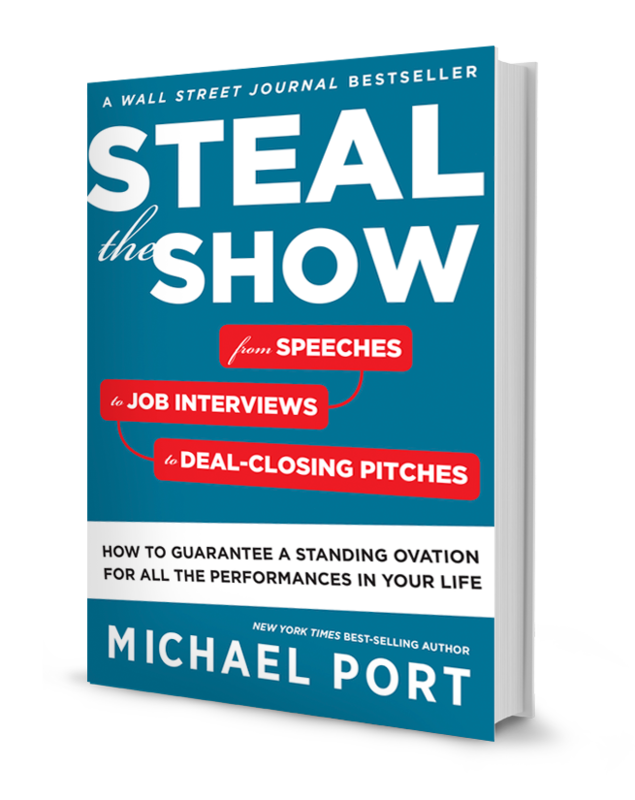 In the meantime, this is Steal the Show with Michael Port, I am Michael Port, and I hope you keep thinking big about who you are and what you offer the world. Bye for now.